Wow. For 95% of this book, I was imagining how I’d write it up; praising its hilarity, its pace, its wit. I was going to do a big paragraph about how much I loved all the Harry Potter name swaps. I was going to gush about how Green Wing this whole book is in its absurdity and farcical “you couldn’t make it up” vibes… about how entitled some of the British public are. How stoic, how bonkers how utterly unfit for walking the Earth unsupervised and being allowed to operate heavy machinery. I was going to talk about how the author definitely knows how to regale his audience with almost Keaton-esque timing…It’s all in here. But the last entry, the last major incident that Dr Kay deals with in his career as an ObGyn senior registrar is chilling to the point where all of the funny, human warmth of the other 250 pages kind of feels distant and like it happened in a different book. I think the last 5 pages of this book is going to haunt me forever. 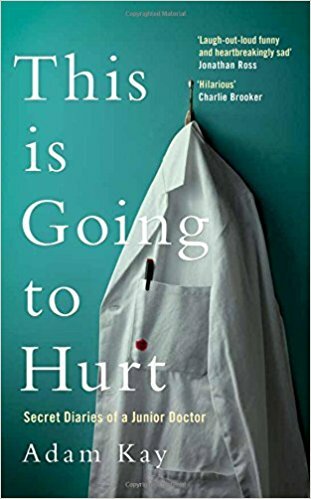 What starts off as a hilarious but illuminating peek behind the curtain into the operation of NHS hospitals becomes a very sobering biography of a beloved institution on the brink of collapse- a diary of a man with a scalpel and a wipe-clean hoover desperately trying to keep things running in a system that seems designed to make everything grind to a bloody, crunching halt. Not because of these greedy, workshy doctors that won’t turn up for a Saturday shift and are only in Medicine for the special parking space and the rivers of cash, but because there are simply not enough doctors to do all of the things that need to be done so that people don’t die. The ratio of work to sleep/home/sustenance sounds like something out of a PoW camp. The normal rules of workload, work/life balance and being awake enough to function simply do not apply and it is both horrifying and fascinating. I’m worried now that writing this so soon after finishing the book (within 30 minutes) has made me err on the side of glumness, so I just want to reiterate what a (and I do not use this phrase lightly or without a trace of self hatred) laugh out loud book this is. I read half of it in one sitting, sat in a plastic chair in the King’s Mill Hospital A&E waiting room, watching the giant, rusty, beloved behemoth that is the NHS in motion. I marveled at the smiley, efficient nurses as I tried to stifle snorts about the likelihood of French holiday homes, or hold in a horrified WTF face at the “degloving” story. But I was always, always amazed at the commitment, the proficiency and the sheer iron will of Adam Kay and his colleagues, who soldiered on long after any normal person would have understandably collapsed in a snotty, tearful mess. These people are superheroes that don’t even realise they are extraordinary. I urge everyone with eyes to read this. Partly because it’s painfully funny, partly because it’s pretty much the whole of human experience wrapped up in scrubs and then bled on. Mostly though, because nobody could read this, this dispatch from the frontline of an NHS hospital and fail to recognise what an asset it is, what a good thing we have here and how ESSENTIAL it is that we protect it. Nobody could read about these men and women repeatedly jeopardising their own home lives and happiness for the wellbeing of total strangers and not feel compelled to defend and protect the NHS and all who sail in her with their last, gurgling breath. READ IT! !